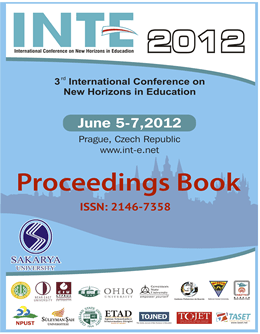 “The International Conference of New Horizons in Education-2012 (INTE-2012)” is an international educational activity for academics, teachers, and educators. It promotes the development and dissemination of theoretical knowledge, conceptual research, and professional knowledge through conference activities, the conference proceeding book. Last year, INTE-2011 received almost 450 applications. The conference academic advisory board accepted 244 applications. * The Turkish Online Journal of Educational Technology – TOJET (www.tojet.net) (SSCI). We would like to invite you to share your experience and your papers with academicians, teachers, and professionals. Papers can be sent in English, Turkish, Czech, German, Portuguese, Italian, German, French, Russian and Spanish but brief English abstract is required. Presentations should be done in English.